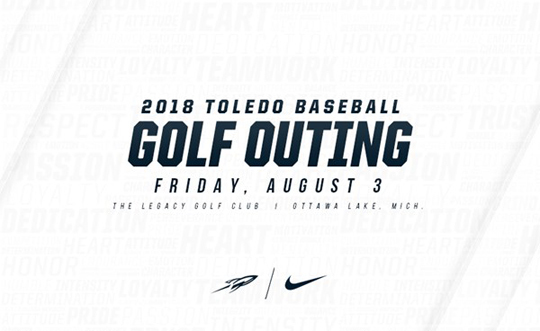 The Toledo baseball program will hold its annual golf outing Friday, Aug. 3, at the Legacy Golf Club in Ottawa Lake, Mich. Registration for the event will begin at 10:30 a.m. with a shotgun start scheduled for 11:30 a.m. The day will include free access to the driving range, as well as lunch and a post-golf dinner in the clubhouse. Hole sponsorships are $100 and available to any individual, family, business, etc. The deadline to register for the golf outing is Monday, July 30. To RSVP, or for any questions, contact the baseball office at 419.530.6263. This entry was posted on Friday, July 13th, 2018 at 3:31 am and is filed under Advancement, Athletics, Events .